The start of work on the $215 million Haughton Pipeline project has been marked with a breaking ground ceremony attended by Premier Annastacia Palaszczuk and Townsville Mayor Jenny Hill. Townsville City Council says the project, which includes 36km of 1.8m diameter pipeline between the Burdekin and the Ross River Dam, will be completed within 26 months. The pipeline was funded by the Queensland Government, which provided $225 million to Townsville City Council to improve water security in Townsville – including $10 million for water education programs. The Premier said Townsville needed a secure water supply to ensure the city kept growing. “This new pipeline will not only guarantee Townsville’s water supply, it will also be a huge job-creating project," Ms Palaszczuk said. Townsville Water general manager Scott Moorhead has pledged to work closely with local businesses to ensure they get the largest slice possible of the work on the project. 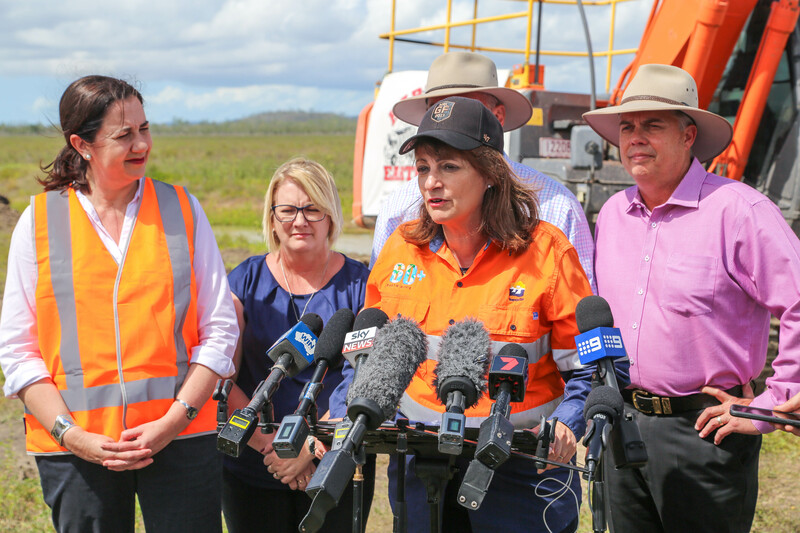 PHOTO: Queensland Premier Annastacia Palaszczuk and Townsville Mayor Jenny Hill (front) mark the start of pipeline work with Minister Assisting the Premier on North Queensland Coralee O’Rourke, Townsville MP Scott Stewart and Thuringowa MP Aaron Harper.